To furnish the diverse requirements of our clients in the best possible manner we are involved in offering an extensive range of Hydraulic Fitting Form Tool. We feel immensely pleased to manufacture and supply an exclusive gamut of Carbide Combination Form Tools. To furnish the diverse requirements of our clients in the best possible manner we are involved in offering an extensive range of Circular Form Tool. We are engaged in providing a wide range of Metal Forming. Our customers can also avail this product from us in varied specifications that meet on patron’s demand. As per the needs and requirements of our clients, we are involved in providing Press Forming Tool. - Simple clamp fits to table top. - Cutting & bending parts of hardened tool steel. We are consistently engaged in presenting best Flat Form Tools. Made with the guidance of engineers, these tools are best in finishing and easy to use. Moreover to this, these presented tools are weather proof and can be used safely for longer years. We ensure quick and safe delivery of this flat tool. This section refers specifically to thermoforming tool design. For tooling suggestions on hydro-forming and pressure forming, contact a SABIC innovative plastics representative. Manufacturers of all types of carbide Form Tools ( Profile cutting Tools ) circular & flat in H. S. S., carbide Brazed, Solid carbide. Form Tools, made from High Speed Steel. Made accurately as per end-product requirement. Profile accurately measured within 0.01 mm. 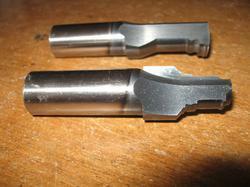 To suit cutting load, the hardness from shank to tip are also varied.